A project that I took on over this past Christmas break was to get my HTPC to display on an LCD display mounted in the PC’s case informaton about the TV program actively being recorded by the Windows Media Center DVR, so that I could see what was being recorded even when the attached TV was off. LCD Display: An nMediaPC PRO-LCD-B display, which is a blue LCD display that can display 2 rows of 20 characters, and fits into a standard PC case 5 1/4” drive bay. A PC running Windows 7 64-bit, configured to act as a DVR using Windows Media Center. This project turned out to be significantly more complex that I originally planned on it being, although after nearly a full day of tinkering, I did finally get it to work! The remainder of this post is a set of instructions for what I did to get the LCD display working to display the active Windows Media Center recording (leaving out many of the missteps and dead ends I encountered along the way, although I do include a couple of the major ones as an appendix at the end of this post). I’m providing this information for my own future reference and in the hopes that it may be helpful to you, the reader; however, please note that this is in no way an “official” set of instructions. It worked for me, but may not work for you. Your mileage may vary. 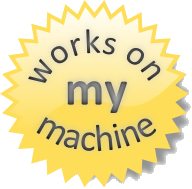 I am awarding this post the official Jeff Atwood / Jon Galloway “It works on my machine!” seal of approval. These instructions assume that you already have Windows Media Center actively running as a DVR on your PC, and that you have a reasonable level of technical expertise, and patience – there are a lot of steps here, and quite a few “moving parts” to get working together! Enough disclaimers; on with the show! Purchase the nMediaPC PRO-LCD-B. As I write this post, it’s available from newegg.com for US $38 shipped. Other nmMdiaPC PRO-LCD models may work with these instructions as well, but I only tried them with the PRO-LCD-B. Power off your PC, and install the PRO-LCD-B in an empty 5 1/4” drive bay. The install was fairly easy; the PRO-LCD-B has two connections: One to a standard disk drive power cable from the PC’s internal power supply, and one to a 4-pin USB connection on the motherboard. My HTPC’s motherboard (a Gigabyte AMD GA-MA785GM-US2H) had several such 4-pin USB leads available on the motherboard, even with all of my case’s front and rear USB ports already hooked up. LCDSmartie is a free open-source program for Windows that can drive the display of text on LCD display devices, including the PRO-LCD-B. Uncompress the “lcd_smartie_v5.4.2.92 Beta” folder and its contents from that .zip archive. I put this folder onto the root directory of my C: drive. None of the out-of-the-box drivers that come with the LCDSmartie 5.4.2.92 release work with the PRO-LCD-B. However, there is another driver available on the LCDSmartie site that did work for me: the “L.I.S VFD” display driver. After downloading that, place the lisvfd.dll file from the .zip archive into the “displays” folder under your LCDSmartie installation folder. Run LCDSmartie (via the LCDSmartie.exe file in the extracted “lcd_smartie_v5.4.2.92 Beta” folder that you created in step 4 above). When LCDSmartie comes up, it should show a small window showing the content that it is sending to the LCD display (although nothing will actually appear on the PRO-LCD-B until the steps in this section are completed). Click the “Setup” button in the lower-left corner of the window to bring up the Setup window. In the LCDSmartie setup window, in the “LCD Size” dropdown in the Display Size section in the top-right corner, select the “2x20” value (the display size of the PRO-LCD-B). Bring up the Windows 7 “Devices and Printers” screen by opening the Windows Start menu, typing “devices” into the text field, and selecting the “Devices and Printers” option that appears. On the “Devices and Printers” screen, in the “Unspecified” section, look for a device named “FT232R USB UART”. Right-click on it and select Properties from the context menu. On the Properties window, select the Hardware tab. In the “Device Functions” table that appears, look for an entry like “USB Serial Port (COM4)”, where the “4” might be any number. Make a note of that number. Close the FT232R properties window and the “Devices and Printers” window. Then, return to LCDSmartie. (It doesn’t appear in the Alt+Tab list on my machine, so you may need to select it from the Windows taskbar). In the LCDSmartie Setup dialog, in the Display Settings section, in the Plugin tab, in the Startup Parameters field, enter “COM4,38400” where “COM4” is the actual COM port value from the Devices and Printers section above. If for whatever reason you couldn’t find the FT232R device in “Devices and Printers”, then an alternative here might just be to try entering different values for the COM port number in this field to see if you can get something to display on the PRO-LCD-B screen. Once this is done, click OK on the LCDSmartie setup dialog. You should now see some text from LCDSmartie (a scrolling LCDSmartie logo, and possibly some other information) appear on the PRO-LCD-B screen on your PC! Once LCDSmartie is successfully configured to display information on the PRO-LCD-B screen, the next step is to get it to display what’s currently recording in Windows Media Center. A plug-in called “LCDSmartie dll to display Windows Media Center status” by Dave Perrow can be used to do this. Extract the MCE_dll.dll, MCE_dll.cfg, and MCE_dll.ini files to the “plugins” folder under your LCDSmartie installation. The MCE_dll plugin relies on another piece of open-source for Windows called Windows Media Center TCP/IP Controller (or “TcpIpController”) to function. TcpIpController publishes a “feed” of what Windows Media Center is currently doing (including what program it’s recording) to a particular TCP port on your PC, where it can be read by MCE_dll. Run the downloaded .msi file, and continue through the prompts to complete the installation wizard. When the installation finishes, reboot – without a reboot, TcpIpController will not work properly. The MCE_dll plugin will display the name of the channel being recorded, along with the channel number and the name of the program being recorded. It gets the channel number and program name from Windows Media Center (via the TcpIpStatus plugin), but we need to manually supply the channel names. To do this, in a text editor, open the MCE_dll.ini file that you previously placed in the “plugins” folder under the LCDSmartie folder, and replace all of the values with the channel numbers and names for your local channels. Now that we have the MCE_dll plugin and its TcpIpController dependency in place, we need to configure LCDSmartie to use them. An explanation of what these values mean, along with some other values you can play with, can be found on the MCD_dll plugin site. Finally, click OK. If your Windows Media Center is actively recording something, you should now see the channel number, channel name, and show name on the PRO-LCD-B display! In the LCDSmartie setup dialog, in the Startup/Shutdown tab, click the “Autostart hidden” radio button, then click OK.
A piece of open-source software for Windows called LCDWriter by “andy vt” says that it will also get an LCD display to display what Windows Media Center is currently recording, among several other functions. However, I couldn’t get the 64-bit version to successfully display anything to my PRO-LCD-B; and the 32-bit version (which can work with LCDSmartie display plugins via a wrapper dll) gave me a runtime error on my PC every time I tried to run it, so I eventually gave up on getting it to work on my PC. The default PRO-LCD-B display software from nMedia has a lot of cool functions, and it was very easy to install and get initially working, but I was unable to successfully get it to display the recording program in Windows Media Center. It also seemed to be slightly buggy in other ways (at least for me); for example, after exiting Windows Media Center, the PRO-LCD-B would continue to display “Channel Listing”, for example, instead of reverting back to the default date/time display. Thanks to the authors of LCDSmartie, the lisvfd.dll display driver, the “Windows Media Center status” plugin for LCDSmartie, and the Windows Media Center TCP/IP Controller. Without all of those open source projects having been developed and made freely available, I wouldn’t have been able to complete this project – or at least, it would have taken me significantly longer to code up a solution myself!